Well, this is sort of the sausage-making version of sculpture. But I think he’ll come out OK in the end. The body armature is only about 1/3 finished, and there are still a lot of decisions to make. Probably a lot more changes coming, too, as I continue to change my mind every 15 minutes. It was fun working on him outside, but the weather is turning stormy, so I guess I’ll have to finish him down in the basement. That means he not only has to fit through my front door, he also has to be a shape that can be maneuvered through the kitchen and down the basement stairs. Wish me luck. wow you have an active and thriving website. First since you are doing dragons i wanted to point out Dan Reeder, quite the dragon artist himself at gourmentpapermache on facebook. he probably has a website, he has books out. Can i adhere your paper mache recipe straight to a metal armature. Check out the rain gutter strainer. It’s a round diamond screened strainer that stretches to fit the pipe, I’m using it for lampshade armature. I’d like to use it for doll making. You are amazing, I am currently enrolled into art appreciation and I have chosen to do a project which consist of taking every day materials and making them into a work of art. I think you are a true inspiration for this work. I love all your videos so informative, and super helpful!!! I am currently doing a Halloween piece of the grim reaper holding his scythe. I hope it turns out good. I will be using oil based clay for the mold and then your raw mache recipe. Hi – do you sketch your ideas down? I have not done paper mache sculpture yet … it’s on my do list. Having studied many dragons with my great grandson, a dragon expert, I think I would have built an armature with something like different size dowel rods, stuck together with a small blob of something to make the joints, then using pieces of chicken wire (poultry netting) molded to hold it in shape. You could poke the ends of the dowel rods into the body to hold it in place. After that, apply the paper mache over the frame and the dowel rods would look like the supporting bones in the dragon’s wings. Now I want to put away my groud carving gear and try this out for myself. I love your website, and will eventually use your paper mache recipe for adding sculpture to my gourds. In my previous post, I was referring to making dragon wings, not the body support. Sorry if that was a confusing post. I saw the frame you were constructing, and did not have time to view the video. I thought that was what you were using for the wings! Sorry. Another suggestion that could be used on other projects. After those outdoor lighted Christmas deer have outlived their purpose, may people throw them out, or offer them at garage sales. Their frame would also be useful as a starting point in some projects. Again, I am probably out of my league in these suggestions … it was just a thought. Hi Jonni, I love the way your dragon is coming on, I am so glad you have troubles, makes us mere mortals feel not so inadequate when we are struggling to get things right. Good luck with your new dog, they can take a while to get to accept that they have adopted you. I took on a six year old German Shepard last. He was well trained in a most ways, but he had never seen a horse before, nor I think run free before, (usually locked in a yard). He is only just now accepting that I am the pack leader, and I don’t approve of barking at horses and cows. I decided I would do a market stall with lots of paper mache, see how it goes, so making lots of dogs, (life size). I will post pics when I get them finished and painted. Chris, I would love to see the pieces you’re taking to the market – and be sure to let us know how that goes. A friend of mine has two 6-year old German Shepards, and she is still having problems with them trying to chase the neighbor’s horses. She lives on a large property, but the fence between the two properties isn’t good enough to keep her dogs from entering the horse’s space. Do you have any tips I could pass on to her? Thanks, Chris. Maybe the only thing that will help in my friend’s case is a better fence. Electric fence sounds like a good solution, since they aren’t terribly expensive. I’ll pass it on. Hi Denise. I must get working on that dragon – I took a few days off and did absolutely nothing whatsoever. It was kind of fun. Today, it’s back to work. The body is now done, but I still need to reinforce it with rebar, and make the wings. With a dragon the size you’re contemplating, you’ll probably want to make him hollow, to reduce the weight. You could use chicken wire over a rebar frame, or use the fairly complicated (but amazingly strong) armature ideas by Monique Robert. And I also recommend reading Dan Reeder’s Papier-Mache Monsters book, for more ideas about light-weight armatures. My local humane society has lots of tips on working with various behaviors with dogs. here is the webpage. Scroll down on the page and there is a whole section on Dog behaviors. Good luck with your new dog. I really enjoyed watching your struggle! — an artist’s mind in action and at work. I like what you are doing and the process. I can’t wait to see what is next. I vote to keep the wings, even if they are small! Maybe she is a baby. Of course, I could think differently tomorrow, or when I see the next stage. Thanks so much for doing this. It is not only educational and entertaining, but motivating as well. I wish I were doing a dragon, but I have moved into a very old house and am trying to get it in a state of livability. I’m in a very old house, too, and I still have a lot of projects I need to finish to make it work right. I consider it an art project, in a way, just to make it seem more fun. I hope you’re enjoying your new home. There will be plenty of time for dragons later. Always fun to see you work through issues as they come up. I love seeing other artists’ process. I know you have him pretty taped up already, but it occurs to me that you could reverse him on the sawhorse, so that the longer legs are in the front, and the back legs could be sort of crouching. With wings extended, he’d have a look of almost-taking-off: pretty dynamic. On the body shape, you could make him have a narrower chest and a fuller tummy, which would lower his center of gravity even more, and make him even more stable. 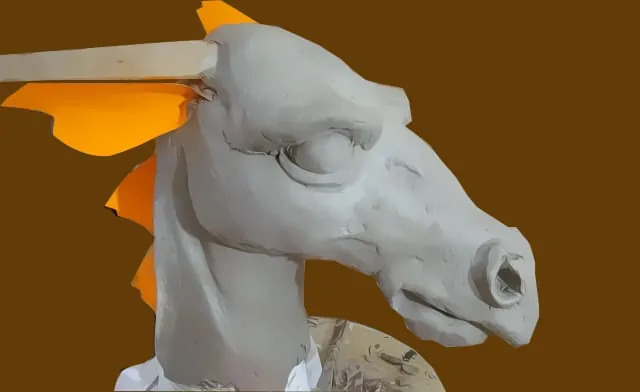 I was surprised and then inspired by your choice of the insulation foam board: perfect way to scale up from the cardboard templates in your smaller sculptures. The scoring and shaping possibilities, as you show in the neck (and I assume the tail) are also inspiring. One could have a lot of fun with that! Your ideas for the posture are great. Now I have to go downstairs and look at the critter again, to see how much work it would be to change it. Probably not much. Hmmm… crouching dragon. Almost sounds like a yoga posture. The insulation board comes in big sheets, which I thought would be much easier than trying to round up large pieces of cardboard. Cardboard, however, would actually be stronger, and wouldn’t need to be cut to make it curve. Next time, I’d probably make a trip to the local appliance store and get a refrigerator box, instead. By the way – I bought that little dog I mentioned in another comment. He came from a breeder, and they seemed like nice people (I’m trying really hard not to be judgmental, but it’s not easy) – but the dog stayed in a cage for way too long. Any tips on taming him? He’s no longer quite as terrified as he was when I got him, and he does ask for cuddles now instead of always running away. But it’s going to take some time. Any tips? I feel your pain! I use the “sausage making” process on all my papier-mache projects. I have faith that it will turn out well in the end. You are amazingly talented and a good problem-solver.